Find out how two simple visits to your Columbia, SC dentist could give you a brand new smile. Are you tired of looking in the mirror and noticing small dental imperfections? Are these issues keeping you from having the beautiful smile you want? If so then it’s time to contact your Columbia, SC dentist Dr. Joel E. Johnson about dental veneers. Dental veneers are thin, custom-made translucent shells that are adhered to the front of your teeth by your Columbia, SC dentist to hide dental flaws and change the color, shape or size of your teeth. While often made from porcelain, dental veneers can also be made from composite resin. Porcelain offers a variety of benefits over composite resin including the ability to resist surface stains. Porcelain also reflects light, which offers a tooth-like quality. Talk to your Columbia, SC dentist about which type of veneers are best for your smile. Dental veneers have the ability to give you a whiter smile when teeth whitening treatment just wouldn’t be effective, particularly for internal dental stains. Dental veneers can also give you a straighter, more aligned smile without needing braces. The first step to getting dental veneers requires minor tooth preparation. During this tooth prep your Columbia, SC dentist will remove trace amounts of tooth enamel to make room for your veneers. This process is completely non-invasive and won’t require anesthesia to be completed. 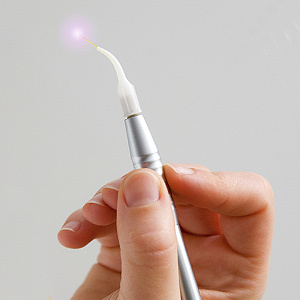 We only remove about ½ millimeter of enamel from your teeth. Then we will take impressions of your teeth, which will be sent to a lab where they will make your veneers. Once your veneers have been made, we will have you come back to our office so we can permanently cement the veneers to your teeth. Before attaching them, we will temporarily place the veneers to check the look, and make any adjustments necessary. Then we will clean and roughen the surface of your natural teeth to help make bonding easier, and apply a special cement between your teeth and the veneers. Finally, we will use a special light to harden the cement. Ready to find out more about dental veneers and whether they are right for you? If so, then it’s time to call your Columbia, SC dentist Dr. Johnson today to schedule a consultation. Let’s get you a smile that you’ll be proud of!